The St. Augustine, WATX 500, will add the final touch to your high-density seating requirements for rail travel plans, reminiscent of the golden years of passenger train service. Restored to its original 56-seat coach configuration, the seating area has been refurbished in a beautiful manner while keeping dependability, quality, and comfort as the key objectives. Adjustable seat backs and long-distance leg rests offer a comfortable ride. The beautifully decorated and spacious rest rooms with retention toilets at each end of the car add convenience. The climate control heating and air conditioning system maintains a nice environment inside the car. Traveling on the St. Augustine will be a unique experience for your passengers. The St. Augustine is AMTRAK approved with head-end power, 27-point connection, main reservoir airline, and superliner compatibility. The car is fully self-contained with a generator. 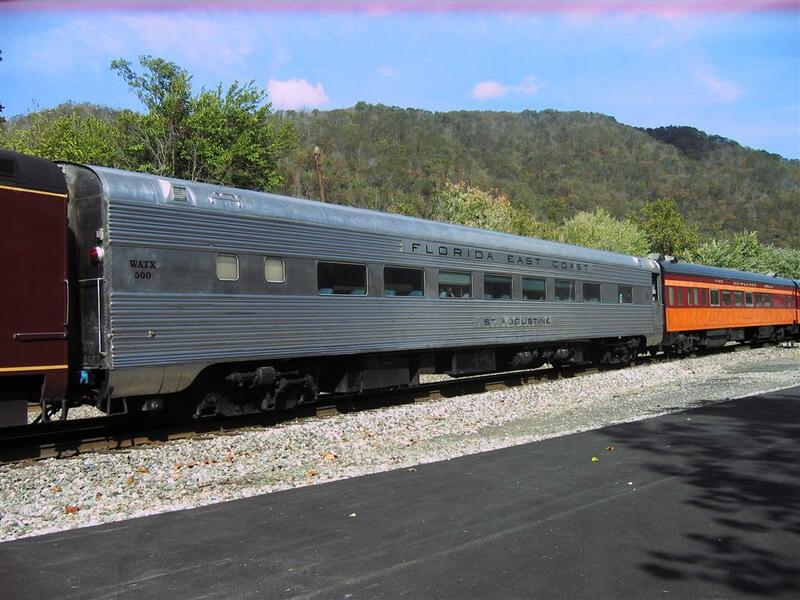 HISTORY: This coach was built in 1954 by Pullman-Standard for the Florida East Coast Railroad and named the St. Augustine along with three others: Coca-Rockledge, Hollywood, and Miami. The St. Augustine saw service on the Dixie Land route between Chicago and Miami. The car also saw service on the New York to Florida train until 1971. With the formation of AMTRAK, the St. Augustine continued operation on trains out of Chicago, New York, and Florida. In 1981, AMTRAK sold the car to a short line tourist operation in Virginia. 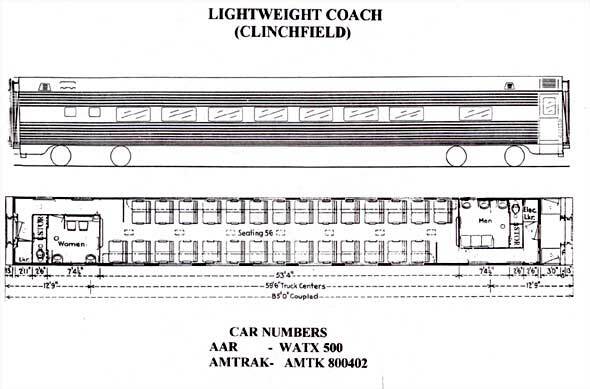 The Watauga Valley Chapter NRHS purchased the car in 1986; completely upgraded the mechanical system to AMTRAK standards; fully renovated the interior; and renamed it the Clinchfield. It was assigned AAR reporting mark WATX 500. In 2013, the Watauga Valley Railroad Historical Society & Museum, in keeping with its mission to maintain historical accuracy whenever possible, restored the car's name to its original St. Augustine.